Easy to use. Loud enough (adjustable volume). Covers all the rhythms I need. This meteronome is one of the best available for its price. For people like me who do not want fancy rhythms but just enough to keep a check on how one is progressing this is the best one can get. Its small and light but its loud and easy to use. I love this metronome. It has a broad range of tempos and time signatures. The volume knob and mini output give you unlimited output options, including feeding your keyboard "Audio In", ear phone, amp, monitor system, recording system, or other configuration. The "tap tempo" features allows you to determine the tempo of recordings with ease. Complaints are minor. The rubber buttons require considerable pressure, which compresses both button and finger. There is no precise "moment of contact" when pressing these buttons. Without a tactile click, the Tap Tempo function feels "mushy". The Tap Tempo function is still "good enough", but stops me short of giving this product five stars. Also, I wish that the chassis had a little more durable feel. Neither of these is a deal-killer. 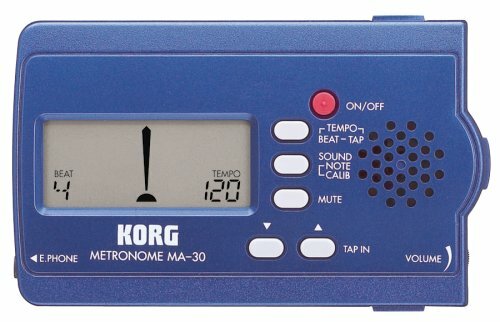 A great metronome for the price. I've been using this little gem for over 2 hours a day for 3 days now and I am ALREADY a little faster and more coordinated with my drumsticks. Once you give the instructions a quick read it's easy to navigate through what you want to do. I love the "tap in" feature where you can listen to one of your favorite songs and literally tap a button a few times in a row to find the beat of the song and then set this metronome to play that rhythm. Then within that customized rhythm you can set it do the 1/4 note, 1/8 note or 1/16 note. I have an electronic drum kit (which does come with a metronome built in to it, but since I don't have it hooked up to a PA speaker, I have to use my headphones to hear the metronome) and sometimes I just want to practice coordination without headphones. This is PLENTY loud enough to guide you along as you're playing. It's probably almost loud enough at full volume to practice on acoustic drums, although it would be close depending how hard you play. The only CON I would say is that the LCD is not backlit, which would be really nice to see better at night, but I can't drop the rating on this because it's clearly not backlit in the description and photo. Poor volume control, can't tell beat one from beat two in 2/4 time. The volume control goes directly from inaudible to painfully loud when using an earphone, yet not loud enough when using without an earphone. Can't distinguish the lead beat in 2/4 time. The digital display is not precise, rather seems all over the place with way too large digital dots on each beat. Unuseable. I am looking for a better one right now. I ordered this for use in keeping a beat while exercising, so I have to say up front that I am not musical. I have no idea how this would work for someone who wanted to use it for music. That said, this little metronome is perfect for my use. It is so easy to set up that it took me only a few minutes (and like I said, I know nothing about music). It is small (compact), has a little pop-out stand and a plug for an earphone. It also has a volume wheel on the side. I'm sure the web page here will give you any specs that I missed. The Korn MA-30 Ultra Compact Digital Metronome is something that I have had ever since it's released, and it still is rugged as ever. The attractive blue casing works very well with the portable unit, with the battery lasting a long time, as a matter of fact, mine still hasn't needed to be replaced. It is very accurate, easy to hear with it's loud speaker. (if you can't hear it, the headphone jack is at your side), and if you can't hear it, it even has a electronic screen that you can follow to play the right rhythms a la Guitar Hero (not exactly, but a concept that reminds me of playing the game right). It has the fundamentals down right, but it doesn't just tick and tock in a given time signatures. While not extremely feature packed, it does more than just click in quarter notes, and it can do the other common needed beats like egth notes, triplets, and sixteenth notes. It can even find the right tempos and rhythms for you. This is a great buy, it does what I need it to do which is to keep time while I play my recorder, flute, trumpet, keyboard, etc. No, you don't necessarily hear it over the music (especially when you're banging on your drums) but are you supposed to? I listen to the beat, feel it, and play, and only at times do I stop and check if I'm still on beat. Also, if you don't hear the metronome, you can check it visually via the pointer that swings rights and left.